As we have been constantly been reporting, Rcom is hard at work upgrading its CDMA subscribers across phase 1 circles to its new upcoming 4G network in partnership with elder brother’s Reliance Jio. Few days back the operator had begun upgrading FWP subscribers to the new GSM based fixed wireless phones, now the process has been extended to EvDO based data cards as well. 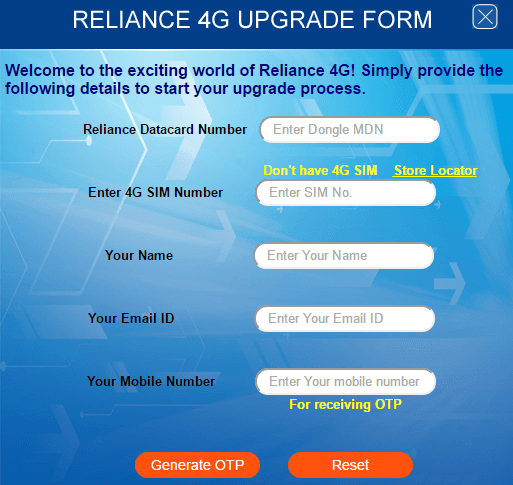 Rcom subscribers who possess Netconnect or Netconnect plus dongles also including Reliance 3, Pro 3 and Rev.B Wi-Pod dongle users can now head right over to the netconnect official website and find the ‘Upgrade to 4G’ button and click on it to find the upgradation form which they can fill out and submit. The subscriber needs to pick up a blank 4G sim from his nearest Reliance gallery for Rs. 25 to Rs.50 depending on the circle and also varying from store to store. In the upgrade form the subscriber needs to fill in his 10 digit data card number, the 19 digit number printed on the back of the new 4G sim card, his complete name as per the company records, the registered email id and the 10 digit registered mobile number. Upon successful entry of the above mentioned fields the subscriber will be able to generate an SMS based 4 digit OTP code which he then needs to enter as the final detail before submitting the upgrade request. The site then confirms the successful submission of the request and notifies the subscriber that he will be intimated through an SMS when the process has been completed, until which time he can continue using the existing data card. After the successful submission of the 4G upgrade form the subscriber is directed to the e-store page of reliance communications to place an online order for the LTE based Wi-Pod device which has been launched by Rcom at a promotional discounted price of Rs.2699 but the store page is currently under maintenance and so the ordering will need to wait until the page is back and functioning again. Also note that the same 4G sim cards which are used for upgrading CDMA handsets are to be used for dongle upgrades as well, there is no need for any FRC or resubmission of any documents or photographs for buying the blank sims.